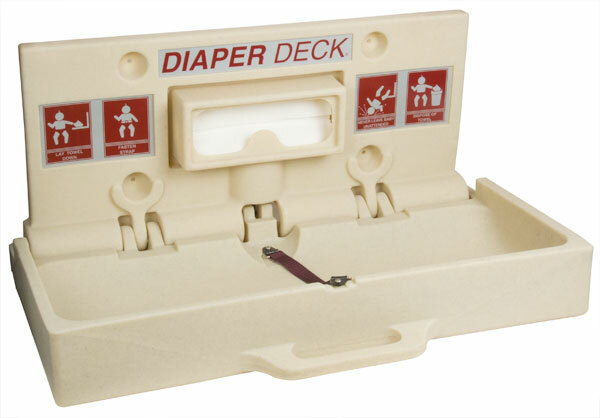 This commercial baby changing table utilizes a horizontal collapsible table and is manufactured by Diaper Deck. It mounts to the wall, and features a compact design that makes it so the Diaper Deck Changing Station can fit in the smallest of restrooms. The horizontal design makes it so infants can only roll towards the wall or their guardian, reducing the danger of a baby rolling off the changing table. The table will not open past 90 degrees. The table is constructed of high density polyethylene plastic that can be easily cleaned, and can support up to 400 pounds of static weight. The construction of this unit makes it impervious to odors, mildew, and mold. This unit has another safety feature, the Safe Strap™, which is a uniquely designed safety strap that functions through a clip lock fastener that can only be released by the parent. The lowering and retraction of the changing bed is enabled through a pneumatic air pump is used for controlled movement. Mounting hardware is included with the unit. This unit is available in three colors. When ordering via phone or submitting a quote online, be sure to specify color. 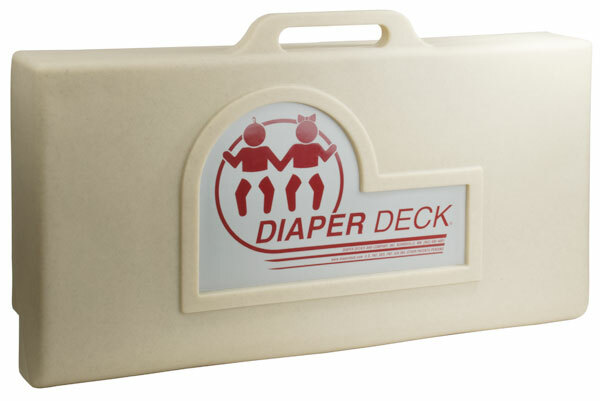 Unit dimensions: In the closed position, the Diaper Deck Changing Station projects only 4½” from the wall. When opened, it projects 18½” from the wall. Unit has a height of 14½” and 32” overall length. Weight: 20 pounds.